The food was tremendous, but I found myself almost too preoccupied exploring the wine to really appreciate the pairing to the degree that I should’ve. When I arrived back home with a couple of half-bottles that had been bequeathed to me as a parting gift, the roommates’ ears perked up at the mention of free wine on a Monday. What followed was an eye-opening journey to the heart of the generational wine appreciation divide: how, exactly, does a demographic raised on Gary Vaynerchuk and Trader Joe’s (or, perhaps in most cases, only Trader Joe’s) react to serious, complicated, and expensive bottles of wine? The W&FS is the oldest such organization in Los Angeles, tracing its roots back to 1934, and their seasonal lineup consists of six food-and-wine dinners, most of which are black-tie. The season’s final dinner, however, is a more casual affair (at least in appearances, although it certainly remains formidable in a gastronomical sense), and is held in the small dining hall of an equestrian center in bucolic Griffith Park. Members are given scorecards to rate the pairings: day boat scallops with Russian River Chard, pork belly with Pinot, sirloin with Bordeaux, panna cotta with Riesling Eiswein. The roommates, I knew, would comprise an interesting panel; although all three are frequent attendees of Young Winos meetings, none of us (myself included) have much experience tasting bottles priced in the three figures, especially not the French ones. Doug got things off to a good start when he took a gander at the Bordeaux and asked, “what’s a chateau? Is that what the groundhog sees on February 2nd?” We thought better of it and started with the Chard. The 2001 Kistler “Vine Hill Vineyard” Chardonnay (Russian River Valley) had been open for a few hours now, and its bouquet had become much more expressive than I’d remembered from earlier in the evening. The roomies marveled at the golden straw pigmentation, and Max offered the insight that “in my experience, whenever a wine is piss yellow, I always enjoy it.” Phraseology aside, I know exactly what he meant — that nice autumn gold on a Chard (or a Semillon, or even a Marsanne/Roussanne) often hints at impressive body and character to come. The guys agreed with me on the nose: very broad and expressive. Max picked out some golden raisin notes, along with “a little bit of cheese,” which turophile Ed identified at distinctly Swiss (Emmental, specifically). I appreciated some vanilla notes, some cream, and a honeyed element I usually identify more strongly with dessert wines. Max concurred, picking up a kind of Sherry character, but after a few minutes this mellowed out into what Ed called a distinct “mustiness.” It wasn’t long before some banana notes made themselves apparent as well — overwhelmed and hungry, we decided to drink it. At dinner, remarks had been made that the wine was served a little cold, resulting in an under-performing palate with heavy acidity. This bottle, only spending about twenty minutes in the fridge before we attacked it, might’ve been served a little warm. If anything, though, this allowed the wine more room to stretch out, almost like a sunbather on a chez lounge, and to express itself fully. “Oh man, you can just chew on that,” Max purred. The wine was broad and buttery, with a playful ribbon of tartness running through it. Ed repeated his banana finding, and Doug enthused that “it doesn’t have that cheap Chardonnay thing” — specifically, a gob of butter and oak that smears itself unceremoniously around your mouth and then disappears. What I liked most was that the acidity that had dominated the palate at dinner was now harmonizing beautifully with the the oak and the earthiness. Served warmer, this was a delightful and well-balanced wine that really expressed itself. Max re-affirmed himself as the resident epicure by mentioning that he’d like to pair this wine with scallops — which is exactly what we’d had with it at dinner. Vowing to buy some of this the next time we see it (and have concurrently just received a hefty bonus at work), we moved on to the Bordeaux. The 1995 Chateau Ducru-Beaucaillou (St. Julien) is a second-growth Bordeaux from the rive gauche. This bottle had been open for several hours as well, and may even have been decanted and re-bottled at some point that evening, so it was all ready to go. Upon smelling it, Max put words to our communal thoughts by remarking that “nothing jumps out at you.” This, for me, brings up a crucial characteristic of our generation; with very few exceptions, even the better tasters among us have learned our stuff on bottles from California and Australia, not France, which has the effect of fostering an expectation — especially when you’re drinking an expensive bottle of Cabernet — that flavors and smells will “jump out at you.” It’s a bit like learning how to drive cars, including perhaps some expensive cars, and then climbing onto a beautiful thoroughbred and complaining that it doesn’t go fast enough. I’m as guilty of this as anyone; I agreed, nothing on the nose “jumped out at me.” So I encouraged the roomies to settle into the saddle, as it were, and try to explore and appreciate the character of the horseback ride. Ed took this sentiment to heart and mentioned that it smelled very “controlled and soft.” Max picked up a little earthiness and some dark chocolate. Swirling their glasses and sniffing deeply, they both unearthed some juicy blueberry and a little bit of cherry. Max suggested some brown sugar; I offered cinnamon, and he agreed (and threw nutmeg at me for good measure). Doug mused that “I don’t know what velvet smells like, but there’s something velvety about this.” Ed then said it smelled leathery, and I realized that it smelled distinctly like the inside of an old library book. A delicate, subtle, and fascinating nose, well worth the extra effort. To be fair, not everyone had gone Francophile after one glass. Doug picked up a “Crayola” element on the pal, and Max agreed there was something waxy to it. No other specific grievances were raised, but there was a general sense that this stately Bordeaux was much more of a challenge — and therefore, less fun — than a New World wine of half the price. Max referred to the Schubert Estate “Goose-Yard Block” Shiraz we’d had at the Peppery Thunder from Down Under tasting, also a big wine with tremendous poise and complexity, yet one whose abundant flavors were much richer and more obvious than in the Ducru. Why should we waste our time (and money) going on archaeological digs into the depths of these stand-offish French monsters when we can enjoy the same structure and tastes upon the first sip of a big boy from the New World? I was reminded of some advice offered to me earlier that evening by the resident historian of the W&FS, and although he spoke only to me, I got the sense that the words were meant for our whole generation. “Whatever you do,” he insisted, “you need to drink European wines. So many people don’t seem to understand that everything done in California is based on France.” The Winos, I think, have paid heed to this sentiment in our tasting series. We routinely compare California-grown varietals to their European counterparts, as we did earlier this month at the Rhone-style blends (from Rhone and elsewhere) tasting; we also hold Euro-specific tastings, such as the Spain and Portugal survey at Vendome, or the white Burgundy tasting last month. We’re very interested in this stuff, and we’re benefitting from what we learn. We now know that “butter” and “oak” aren’t the natural flavors of a Chardonnay, and that all Syrah doesn’t explode in your mouth like plum jelly and peppercorns. It’s fascinating — and we want to learn more. The challenge to the industry, now, is to realize that such a desire exists in our demographic. 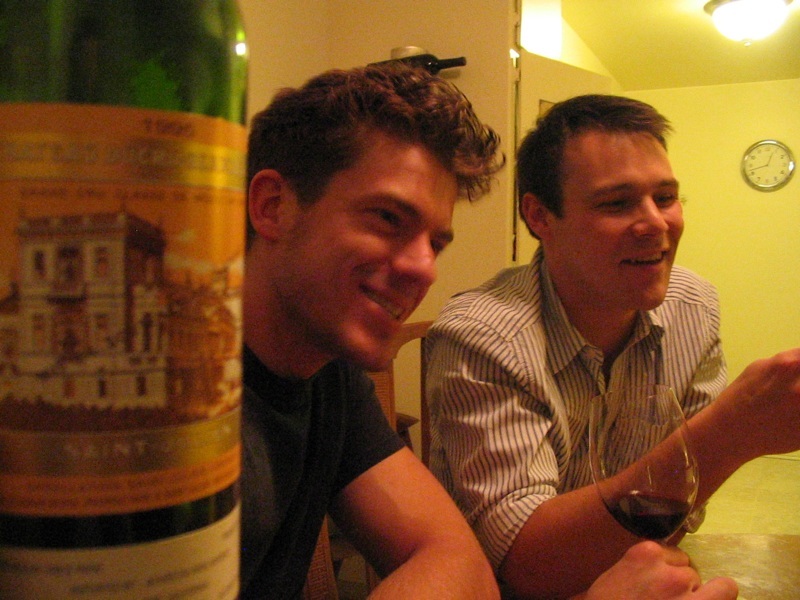 There doesn’t seem to be much of mechanism in place for exposing young people to interesting, affordable bottles of French wine, especially not from Bordeaux or Burgundy. You can find some decent négociant stuff at Trader Joe’s and elsewhere, but our generation seems to prefer more accessible wines from California, Australia, New Zealand, and South America, and to look to Spain (and, to some degree, Italy) for fun, reasonably-priced Euro wines. Spain seems to have really struck gold: without losing their regional character, they’ve still managed to make their wines appealing to young drinkers. Want something refreshing for a hot day? Try a Rías Baixas! Craving some intensity? Have a Ribera del Duero! They’re not patronizing us with animal labels, but they’re also not turning us off with an air of exclusivity, and our generation is buying their wine as a result. We’re not children who want to be fed candy three meals a day; we absolutely want to drink European wines, to learn the languages with which New World producers speak to us in the bottles they produce. But Spain, at present, seems to be the only country making much of an effort to reach out to the savvy young wine drinker, and other countries are missing out on huge — and, ultimately, crucial — opportunities. Max gets precision; sediment, beautiful sediment; see, Bordeaux makes us happy! I think I’m done with wine that costs less than $75 a bottle. At first glance this seems out of my price range. But really its all about priorities. If anyone needs to find me, I’ll be living on the street.